We visited Malaga for the first time as a family just after Christmas 2016, we were really pleasantly surprised by this cosmopolitan and vibrant city (see blog post here). It was so warm and lovely when we visited in winter we decided to stick to the outdoor attractions, so when we visited again to meet up with friends we knew we had to prioritise visiting some of the countless museums that Malaga is now world renowned for; we were particularly keen to do an art trail. We checked in to our AirBnB apartment located in the old town then walked to the port. As it was great weather and a Sunday the Port area (Muello Uno) was buzzing. From the conveniently located roof top bar we could see the busy water side restaurants, bars and stalls, yachts bobbing, live art installations and a crazy zumba band playing music that was impossible not to dance along to. The wide walkways were bustling with pedestrians and cyclists, tourists and locals and reminded us of the Southbank in London and Riverside in Melbourne, a truly international and modern atmosphere and a great area to represent the ‘new’ and modern Malaga. By 4pm on a Sunday the Centre Pompidou Malaga opens it’s doors for free! (A joint ticket to both permanent and temporary exhibitions of contemporary artwork usually costs €9) You can’t miss the large colourful glass cube ‘El Cubo’ at the port, the enterance to the museum is just below. The museum is only two years old, and contains work from Picasso, Bacon, Attia, Leger. Our favourite was the permanent work titled ‘Ghost’ 131 praying women made of foil. There was also quite a few interactive displays which the boys loved. A note for visiting here with small children, whereas our boys were really well behaved the staff were somewhat vulture-like and pounced if you went anywhere near to the ‘line’. This is possibly the worst museum we have ever visited for this experience, our hours visit resulted in five warnings from over zealous staff! The artwork however, was wonderful and worth putting up with the jobsworths! A walk back along the port the children couldn’t help but notice all the wonderful playgrounds. Malaga Park, or the Parque de Malaga, also known as the Parque de la Alameda, runs in front of the new port area, the Muello Uno and contains a fantastic park and small playground. The playground is located in a tranquil and shady space, but the park itself is the main attraction. A great space to let your children run around and explore the botanical gardens, complete with tropical plants, parakeets, fountains, monuments and sculptures. A welcome relief, especially if you have spent your day inside visiting some of the city’s world class museums. A short hop over to the new port and you will also find a small playground right on the promenade. With the standard spinners and boingers it is aimed at younger children, but older children will enjoy jumping from the concrete ‘wave’ structures. It is also the best place to sit back, people watch and gawp in amazement at the extraordinarily huge cruise liners docked nearby. A must if your children are boat obsessed like ours! Past the big wheel and through the old town and towards the dry river Gaudalmedina led us to a former market building home of the Contemporary Art Museum Malaga (CAC Malaga). The queue for the Contemporary Arts on a Sunday evening was enormous, as again entry to the touring exhibition was free on Sunday evenings!! This museum, like most in Malaga is closed on Mondays so we planned to return for a visit on the Tuesday morning. As an alternative we headed back into the old town to join a much smaller queue for the Museo Carmen Thyssen. Housed in an old palace, you can marvel at the beautiful building and see incredible works from old masters in the permanent collection, stunning Japanese art and an exhibition depicting the customs of Indian tribes. The boys were fascinated with the traditional headdresses and tomahawks and we thought the Japanese art was simply stunning. The plan for Monday was to visit Malaga’s beach area for lunch. Although most museums in Malaga are closed on Mondays we managed to find two that were open, the Museo interactivo de la musica (Interactive Music Museum Malaga, MIMMA) and the Picasso Museum. The MIMMA’s motto is ‘please play’ and, with two young children, this is refreshing to hear, especially compared to the glaring staff and their ‘too near’, ‘his foot crossed the line’, warnings of the Pompidou centre. The music museum cost €4 per adult to enter. The rooms are either black, white or red. The red rooms are the best for children as they are interactive and full of instruments visitors can ‘play’ or if you are anything like us, have fun making some noise! This museum is really fun with children, and with instruments from all era’s and many cultures in their collection, it is also fascinating. The Picasso Museum was also open on a Monday at a reduced fee of €4 per adult, as the top floor is currently closed. The exhibition was called 33 Picassos. An incredible selection of paintings and sculptures spanning across 70 years of his artistic life. Although the boys actually like to visit museums, everything in moderation, so after a full morning we headed to the beach. La Malagueta is the closest beach to the centre of Malaga, with great facilities. We sat in the sunshine and ate a lunch of Sardines cooked on the beach. The parrots squaked in the palms and our children played on the park on the beach, whilst we looked on with a glass of vino tinto, bliss! As Malagueta is a sandy beach, it’s great for children to find shells, stones, driftwood and pieces of sea glass. The sea was completely calm so no problem for a paddle, there were even a few swimmers in, not bad for March. The beach is situated next to the Port, there is a passage way through the apartment blocks straight to the beach, the beaches stretch on for kilometres, you’d never imagine that the city lies just a ten minute walk away. After a very relaxing lunch and beach session, to stretch our legs we walked back into the old town past the Roman ampitheatre and into the Bar ‘El Pimpi’, a great example of a traditional Spanish Bodega. As it was still early we pulled up a table into the courtyard area of the bar, beside the Jamons; a great location as the boys managed to get a free sample as they watched the Jamon being expertly carved. The banging overhead and music was a beginners flamenco class taking place in the dance studio upstairs, a great place to sit back, people watch and sample a glass of excellent Spanish wine. Chaos and Mayhem were far from bored as they really enjoyed exploring this fascinating place and were even being serenaded by a local tenor! On Tuesday morning, although it was time to check out and leave, we were still keen to see the Contemporary Arts Centre (CAC). The queues had now completely gone, unfortunately we had missed the touring exhibition but the permanent collection was still open, with free entry. The CAC museum has works from Louise Bourgeois, Art & Language, Olafur Eliasson, Thomas Hirschhorn, Damien Hirst, Julian Opie, Thomas Ruff and Thomas Struth. This large ex-market is a great space with some fascinating pieces of contemporary art. A group of young children were sitting listening to an interpretation of one piece the whole time we were in the museum and our children really enjoyed the space and the wide range of different art and styles. Well done Malaga, great museums, a new port and well maintained beaches. Together with the Fortress, Castle and Markets we mentioned on our previous post on Malaga, it all makes for an impressive city with lots to see and do. 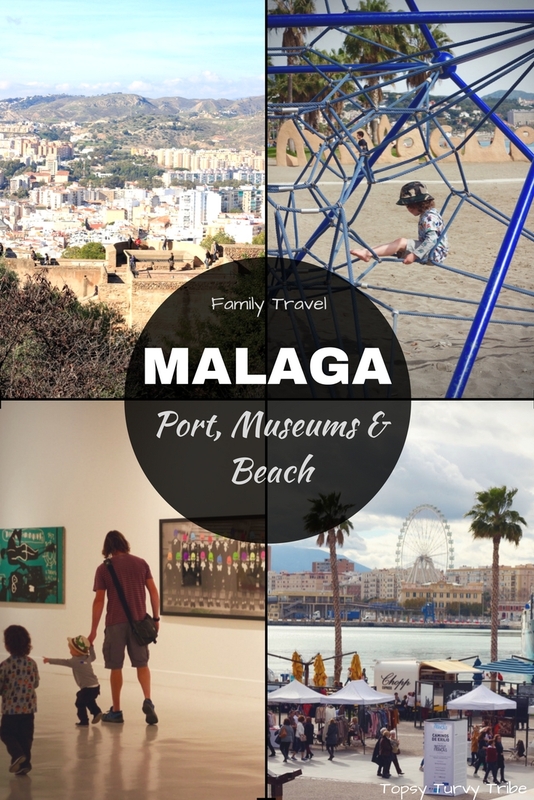 Malaga, a great destination for family travel and far from a boring airport city! There is plenty to do for a city break. Thanks for liking the photos. We saw some great art work we were not allowed to take pictures of, but the museums have their own websites some with virtual tours of the work. Great, it’s fantastic seeing places as a family, we just go at a slightly slower pace, we try to think what activities the children might like and don’t stay out as late as we used to! Wonderful Spanish cities, at opposite ends of Spain from each other. Malaga seems much smaller. I had no idea that Malaga was such a beautiful place. The museum looked fabulous. Thanks Ruth, I’m not sure I would like how busy Malaga gets in the summer but the winter sun really is fabulous, hope you can convince your hubby! Thanks for hosting! We never wanted to go to Malaga as it has an unwarranted rep. Now I’d have no hesitation going back, it’s wonderful! Thanks for commenting. I’m not sure we’d enjoy Malaga as much in the summer but it really is wonderful off season! I can imagine it’s a great place to go with our without kids, we didn’t get a chance to experience too much of the nightlife with the boys in tow! 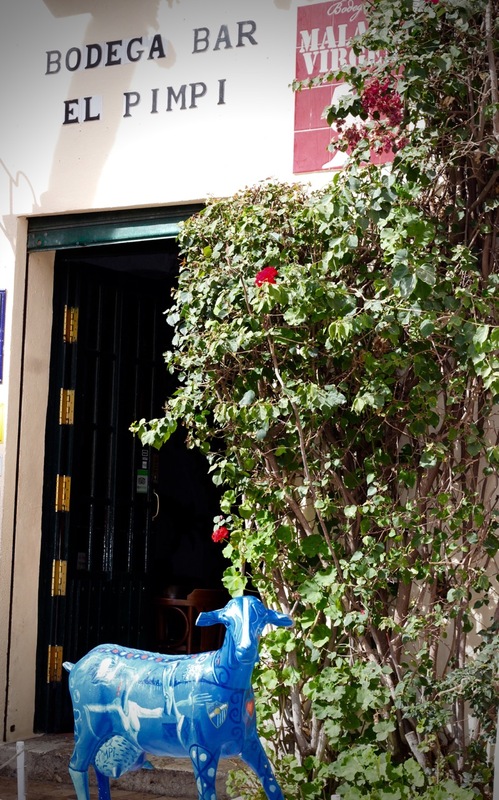 We have just booked to go to Malaga – so this is such a brilliant resource – thank you! I feel even more excited about our trip now! Thank you, have a wonderful time, hope the tips come in handy. We had to go back to Malaga again, have a look at our post on Malaga castle/ Xmas.